Believe it or not: About 64 per cent of men and 47 per cent of women in Australia are overweight. This number even has a tendency to rise! This is not surprising considering what junk food we tend to eat the all day long. Not only does being overweight look bad, but it also bears health risks that are not to be sneezed at! Dieting unfortunately is not a long-term solution. Half portions, low/no carb, low fat, pills or special drinks – I nearly tried them all (except pills, I don’t trust their impact on my digestion and health). Some of them worked just fine, but nothing showed long-term effects. Until I tried Weight Watchers. Weight Watchers is not a normal diet, it is a plan that helps you change the way you eat and to pay attention on what you eat and if you are getting exercises regularily. But it’s not as hard as it sounds. Weight Watchers works with an easy-to-use point system. Every food has a certain amount of Weight Watcher points and you can eat everything as long as you don’t exceed your points. Fitness and WorkOut gain you more points. Weight Watchers is a world wide operating corporation which assists people to lose weight and live a healthy and happy life. Their personalised approach combines healthy eating, excercise and support. By joining Weight Watchers you will step into a program based on three pillars which are referred to as Food, Fit, Feel. These days eating healthy is not always easy. Weight Watchers will teach members to appreciate real food again and create healthy meals. As a basis so-called SmartPoints(TM) takes complex nutrition information and simplifies into one easy-to-use number. Not a secret at all but too often neglected by many folks is the aspect of sports and fitness when aiming for weight loss. Weight Watchers offers fitness plans and hundreds of online workouts for every fitness level. Not only will it burn fat but getting fit will also lift your mood, prevent disease and help control your appetite. Weight Watchers offers a special fitness points system that helps you to stick with your fitness goals. Did you know that the happier people are the healthier choices they make? That’s an observation proven by science. At Weight Watchers, folks are striving hard to help you feel good as much of the time as possible. You will learn to put yourself first as it will make sticking to the program easier. Getting enough sleep, stop eating on the run and recognizing hidden fats are just three aspects of life that Weight Watchers takes care of. Pick one of the three plans available. Online Coaching is from about $6.59/week. You can choose between 3-months and 6-months payment options. Being a one hundred percent internt-based product, Online Coaching gives you access to comprehensive online resources that can help you manage your food and exercise. It does not include any hard-copy printed program materials. Charting your progress and seeing your rewards both happens online. This is where you find tools, tips, recipes, and the essentials to stick to the plan. You can also purchase food products and electronics directly from the website. Be aware that program materials cannot be purchased online. Group Coaching is from about $14.82/week. You pay for your meeting fees one month at a time. With the monthly fee you get unlimited consultation and access to the online weight-loss companion which has interactive tools, tips and recipes that help you stay on track. Group coachings are run by trained Coaches. Get together with like-minded people if you need a motivation boost or have trouble making advice stick. Plus, you can benefit from others’ experiences too. Just find a meeting that fits your life and schedule. Each meeting lasts some 30-45 minutes and is purely focused on weight loss topics. With Group Coaching you get access to unlimited Group Coaching sessions, confidential weigh-ins, weekly program material, online coaching 7 days a week, access to all online resources, online workouts and FitPoints(TM) tracking tools and more. 1 on 1 Coaching is from about $21.53/week. There are 2 options, Over the Phone and Face to Face. Benefit from all the features of Online Coaching plus have your personal weekly coaching session with your personal coach either over the phone or face to face at time that suits you. There is 24/7 support from Weigth Watchers members via the Connect community, too. Need some visual inspiration? Check out the link to Weight Watchers YouTube channel in the info section or have a glimpse here right now. When do you start your healthier life? 35% OFF selected 3 month plans! No Count option: Don't need to count points to lose weight! Introducing Weight Watchers No Count option! Where you don’t need to count points to lose weight. Try it for 30 days for just $30! T&C’s apply. Save unbelievable A$73.50 for your 1st month is free + Zero Joining Fee! Group and Online 6 month plans only. See T&C’s on WW website. Flash Sale: Save up to $93! Today only! Get 40% off 3 month plans! Offer applies to Group Coaching, Online Coaching, Phone Coaching and 1 on 1 Coaching 3, 6 and 12 month plans. Offer valid from 11/04/17 until 11.59pm AEST on 1/05/17. Pls see full terms and conditions at WW’s website. 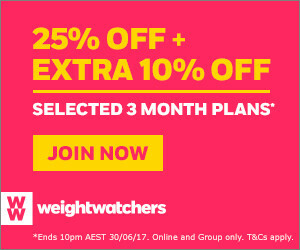 Don’t miss the best deal Weight Watchers offer this year. If you sign up for a 3 month Online Coaching plan, you’ll pay as little as A$3.98 a week. If you sign up for a 3 month Group Coaching plan, you’ll pay as little as A$8.94 a week. Can’t get cheaper than that. You’ll save from A$51 up to A$116 compared to the regular rate! Hurry up, offer ends soon. Watch out for the Have a promotion code? link right above different plan boxes. Copy and paste our code exactly as is into the promo code fields by setting focus to the first field and start pasting the code. Make sure to check Terms & Conditions as ongoing fees apply, if you don’t cancel your subscription after the trial period. However, why should you quit when you can lose 8 x more weight with Weight Watchers than on your own… ;) ? 3 month plan – you will pay upfront the minimum total cost of AU$103.50 and we also do not charge a joining fee on this plan. $39 joing fee will not apply. Hurry up to get another $25.90 discount! Get Your First Month Free! Start now for $0. Hurry, offer ends soon! Promotional offer on Online and Group Coaching 3 month plans (3 months + 1 month free). T&C’s apply. Get 40% off selected 3 month plans! Hurry up, offer ends 25 Jan! – Follow the plan and start losing weight! *Ends 25/1/17. Online and Group Coaching 3 month plans. T&C’s apply! Ongoing fees apply after joining. T&C’s apply. Try Weight Watchers Online Coaching 2 weeks for free. Prices are subject to change at any time. May not be redeemed for cash. Australian customers call 13 19 97 New Zealand customers call 0800 009 009.